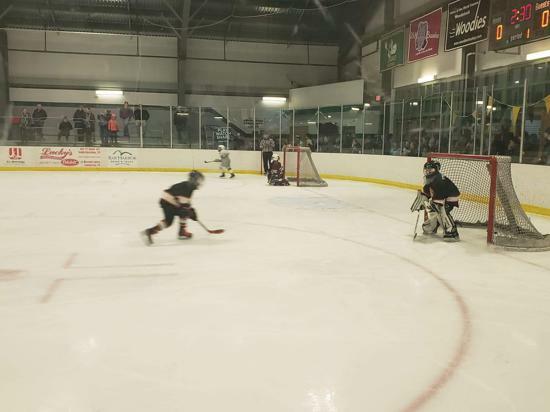 The Bear Tournament was a great series of games for our 10U and 8U teams. A lot of fun was had. Not more fun then watching our 4 goalies take on their teammates and competitors. Congrats to Johanna Kissell, Landon Bigelow, and Chelsea Stockwell on their great job and especially to Dexter Eden of the 8U Travel mites for winning it all for the 8U challenge! Good job kiddos and congratulations Dexter. When we first decided to host this program this February we thought "maybe we'll get 5 or 6 kids". Boy were we wrong! With over 20 kids actually participating in the program we were able to successfully teach kids the basics of skating, and for many the basics of hockey. Thank you to all of those parents and kids who came out regardless the temperatures. It was so amazing to watch the kids start out and to see where they progressed. Look for our next event once the season starts up again in November! 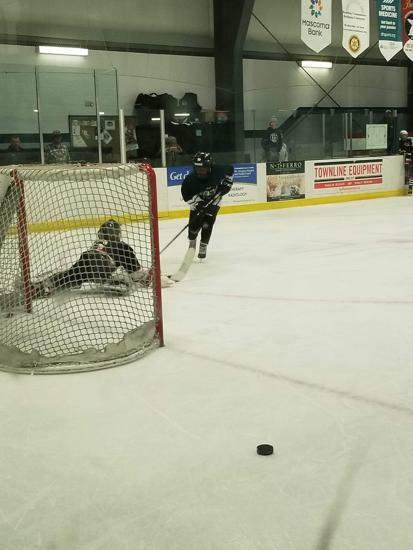 Thank you to everyone who participated in our Try Hockey For Free Event. Don't worry if you couldn't make it on the 23rd, we will be hosting one at the very beginning of next years season. See you at the rink! We would like to take this opportunity to recognize this years recipient of the Grout-Beebe Memorial Sportsmanship Award. 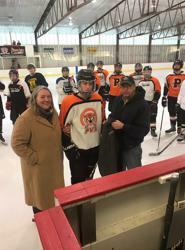 This award is given to an older youth in our program that has demonstrated the true meaning of leading by example displaying true sportsmanship in their hockey interactions, on and off the ice as well as their dedication to our program. Handed out at half time during our Alumni game celebration, recipients are congratulated by former recipients, players, fans, family and friends. 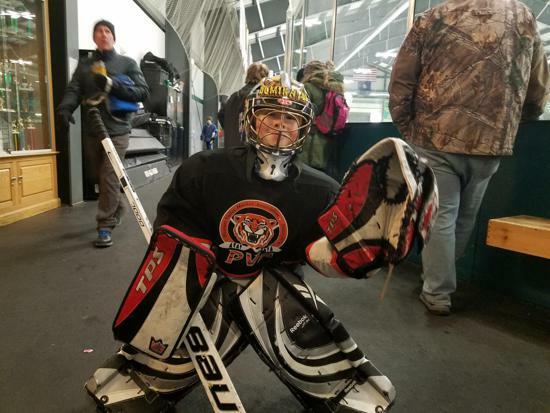 Aidan is a young man who has demonstrated these very skills with his coaching volunteering, his availability and willingness to go the extra mile to help some of our youngest players develop any one of there many needed skills, even if it just means convincing them to get on the ice. Aidan's team availability ended a couple of years ago with many other players deciding to go elsewhere or to not play at all. Despite that, Aidan remains dedicated to the sport by assisting PVA in all the different places that he can. Thank you Aidan for all you have done to continue our great program and for being that example for our players to look up to on and off the ice! USA Hockey has put together this great Youtube video that shows you just how to do it. Thank you to everyone who participated in our Alumni game this past Sunday. 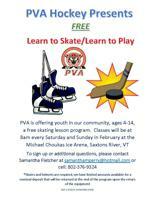 We had nearly 30 skaters come out to represent their home states of Vermont versus New Hampshire. As new fan of this specific game, what surprised me most was the amazing skills these players have, whether they are still playing or not. I am delighted at the fact these "kids" now adults, started their hockey careers with our program. Most importantly though was the respect and recognition given to one of our founding fathers, Phil Hicks. I swear every player came up to him, and he knew everyone of them, it was awesome to see. This is truly an amazing tradition that our program has! I encourage you to attend next years game. PVA Clothing order available, order soon! We are excited to let you know that we have partnered with Bull Dog Design in Keene to provide our program with optional clothing orders. They will be offering us several different items with no minimum order requirements, as well as simple online ordering and payment, so it is a win-win. Below you will find the link to the PVA "Store", you will order and pay directly via this website, all orders will be processed upon the closure of the store, which is on Wednesday, January 2nd. To answer your next question, no orders will be processed before that date. We expect to have delivery of said items two weeks after closure which should be the week of January 14th through 19th. The best part of all of this is that you do your own ordering, payment, and all that needs to be done is get it picked up, which we will do for you and deliver it to the rink. This coming weekend we have several games going on, so come on out and support your home teams. Enjoy your weekend, see you at the rink. If you register your kid online and pay in full by the 12/1 payment deadline you will receive entries into a drawing for FOUR BRUINS TICKETS for a game in March (TBD). The earlier you register and pay the more entries you receive. Scheduled for Tuesday, February 19th, 2019 at 6:30 at the rink. 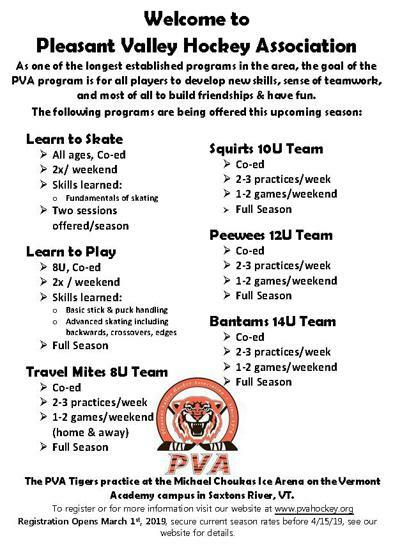 Pleasant Valley Hockey Association has been providing the youth of our area the experience of playing hockey for over 40 years. We are open to all children ages 4 years to 16, that are interested in learning and playing the game. We usually practice 2 times per week with games on the weekends. 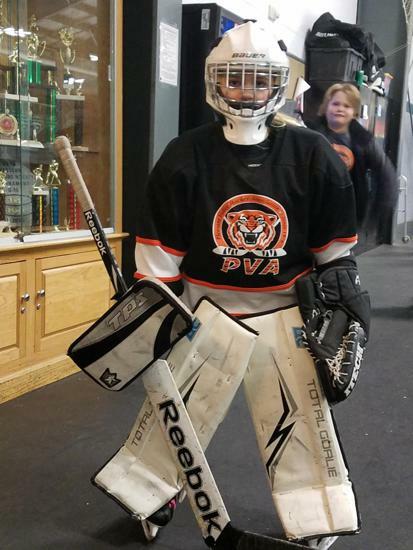 ©2019 Pleasant Valley Hockey Association / SportsEngine. All Rights Reserved.